A lifetime of overeating left Lisea Rossouw weighing over 180 kilos, fighting for breath and wishing for a better life. Tired of being unhappy in her body, she embarked on a journey to transform her body and finally live the life she always dreamed of. 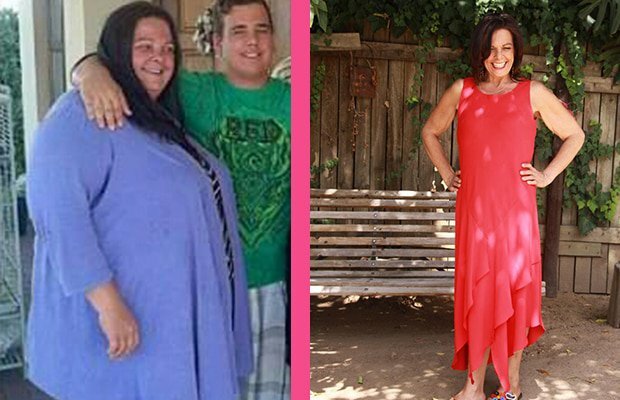 Here’s how she lost 116 kilos and took control of her happiness. Lizea says that growing up she was actually pretty active. She participated in school sports (like netball and swimming) but remembers that even then she was always ‘the big girl’ on the team. She continued to gain weight steadily throughout her 20s and 30s until she eventually started tipping the scales at 180 kilos. Lizea says that for her junk food was never really the problem and that her weight-loss struggles were mainly due to her massive portion sizes. “I was just consuming too much food and bread — bread was always my downfall,” she says. Given her weight, she couldn’t engage in much physical activity. “I actually couldn’t breathe if I walked for more than 10 meters. So, I would just end up driving everywhere. I would spend like 10 minutes looking for parking just so I could be near the entrance of the shop,” she explains. Her turning point came in 2015 when one morning she found herself standing in the kitchen doorway, with her shoulders touching each side of the door frame. It was at that moment she knew she had to do something to save herself. “I stood there and asked myself what I am doing with my life. Only I have the power to make me happy and I had a yearning to live life. It was like a switch and instant realisation that I was in control,” she says. The first thing Lizea did was cut out bread. This small change resulted in her dropping 20 kilos in one month. Throughout her weight loss journey, she reduced carbs and upped her protein, fruits and vegetable intake. But she says the biggest change was listening to her body, “I never punished myself, but I made sure I had strict ground rules like not putting too much food on my plate and listing to my body,” she explains. Her good eating habits were the key to her weight loss in the beginning, as she didn’t start an exercise regime until much later in her journey. “I only started exercising after I lost about 80 kilos because I was fearful that I might embarrass myself, to be honest,” she says. After losing the initial 80 kilos, Lizea started walking every day and gradually increases her pace so that she could start jogging. She says that walking is still her main form of exercise, but hopes to start playing a sport soon. Her eating habits have remained constant since kick-starting her weight-loss journey: she still limits her carbs and makes healthier choices, like opting for a banana instead of chocolate when those sweet cravings hit. “I kept myself motivated by visualising myself slimmer and healthier”. She maintains that ‘listening to her body’ has been the most important lesson because it has helped her make better food choices. “People that I’ve known for years can hardly recognise me. My weight-loss journey has changed everything about me”. “My whole life has changed, I feel like I’m 25 again,” she exclaims. Lizea says that she’s constantly amazed by her body. “The fact that I can now walk without experiencing difficulty breathing is amazing”. Even something as simple as walking into the shop to buy a dress is a joy-filled experience for Lizea. “I used to have to shop at the bigger ladies stores and even then the clothing was too small for me. Now I can just walk into any store and I find clothing in my size”. Lizea goes on to say that she’s now living life to the fullest. “I now have hope and a happier life overall because I’m starting to do all the things that I’ve desired to do for so long,” she says. Enjoy the journey. “This is an amazing experience. You can see how beautiful life is when you don’t limit yourself”. Have a goal. “Find your purpose, and you will find the courage to help you reach your goals”. Believe in yourself. “If you think it, you can reach it”.